Saturday night, a chlorine mortar attack hit the city’s western neighbourhood. Shelling is taking place every evening, the prelate notes. This time, “we saw yellow smoke rise, different from the black and dense columns”. Residents now fear an escalation. Damascus and Moscow call on the UN to condemn the attack. The West is silent. Aleppo (AsiaNews) – Pro-Turkish rebel groups in the western outskirts of Aleppo "launch mortar and rocket attacks every evening" on the city, but "the attack with chemical weapons" on Saturday evening "took us by surprise. We did not expect it and it was scary,” said Mgr Georges Abou Khazen, Apostolic Vicar of Aleppo, speaking to AsiaNews after the nightmare of war and violence came back to the metropolis of northern Syria. 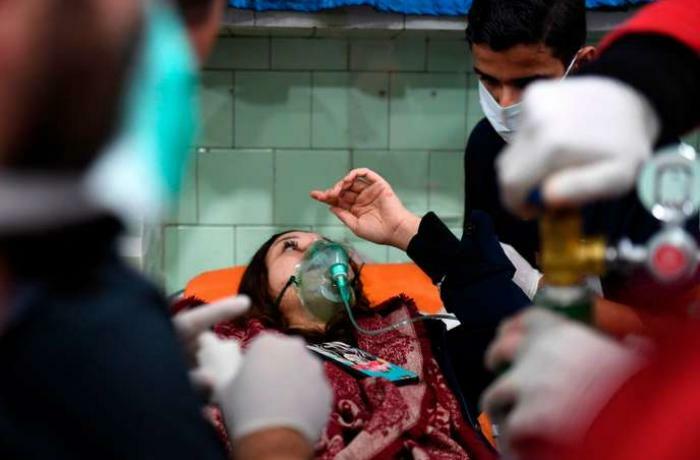 Local sources report that more than a hundred people (at least 107 according to official media, 94 according to independent NGOs) required medical treatment as a result of breathing problems. Many of them were women and children. "For us the attack was a real surprise,” noted the prelate. “It was about 10 pm and we heard the usual loud explosions. Shortly thereafter, however, we saw yellow smoke rise, different from the black and dense columns of dust and debris that follow a normal bombardment. Within a few minutes sirens could be heard as ambulances carried injured people." "No fighting is taking place right now in the area. We are talking about civilian areas with unarmed residents," the prelate explained. The rebels appear to have used shells containing chlorine, launched from mortars deployed in various positions along the western outskirts of the city, which was at the centre of fighting until it was liberated in December 2016. "They bombed a sector not far from our vicariate; only later did we learn that it was chlorine bombs,” Mgr Abou Khazen explained. Local sources report that at least 30 people were seriously injured, including children. Reacting to the incident, Russia warned Turkey to stop the attacks. Russian planes carried out a number of retaliatory strikes against positions in neighbouring province of Idlib, which is still controlled by groups linked to al-Qaeda. The Syrian government and its Russian ally blame the chlorine gas attack on the rebels, who reject the accusation. For now, no one has officially claimed responsibility but the Hayat al-Tahrir al-Sham group is suspected. The latter did not accept the September agreement between Moscow and Ankara. Meanwhile, the Syrian Foreign Ministry called on the Security Council to take “deterrent, punitive measures against the nations and regimes that support and fund terrorism”. Unlike the past when they harshly accused the Syrian regime for the use of chemical weapons, Western governments have not yet responded to the incident. Back in Aleppo fear about a possible escalation of violence is back. “We cannot know the kinds of gases but we suspected chlorine and treated patients on this basis because of the symptoms,” said Zaher Batal, head of the Aleppo Doctors Syndicate. Symptoms, he added, include difficulty breathing, eye inflammation, shivering and fainting. Hospitals had discharged many patients. Batal called it the first gas attack in Aleppo in Syria’s civil war, which has raged for more than seven years. "We hope that it will remain an isolated case,” said the Vicar of Aleppo, “but the fear is so great that it can start a new battle. Episodes like this one have been used as a pretext by Western powers to attack again in Syria. These rebel groups have lost the battle and now try by every means to hinder the return to peace, to normal life." This raises a “big question mark about our future. We hope the situation does not get worse. The Turks had promised to guarantee respect for the truce, instead they allow these attacks."